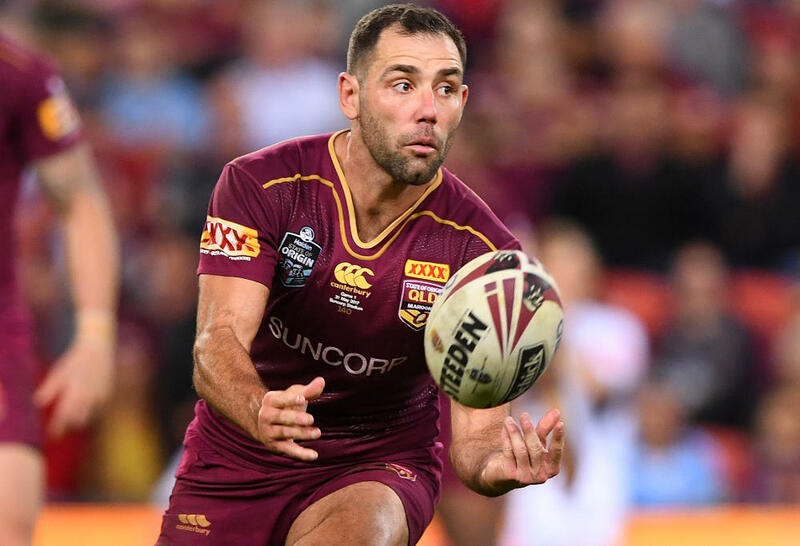 The Queensland Maroons’ team for the second game of this year’s State of Origin series has been named, with some new faces in the mix, and the return of some truly legendary veterans. After an underwhelming effort leading to a blowout loss against NSW in Game 1, Queensland’s selectors will hope this side can deliver a series-levelling win. It’s been a remarkable return from long-term injury for Slater, who looks like he’s barely missed a beat. His ability to read the direction of play from Smith and Cronk is an extra ace up Queensland’s sleeve. Will not stop chipping away at the defence all game long and, simply by the volume of decoys he runs, will open up opportunities which make teammates look better. After surely being close to winding up his career, will savour the opportunity to play among the elite again. The biggest threat to Queensland’s defences over the past decade has been the pure pace that some of the Blues have possessed. It’s a pressure builder when you know you’re only a slipped fingernail away from a line-break and a tough turn-and-chase at any time. 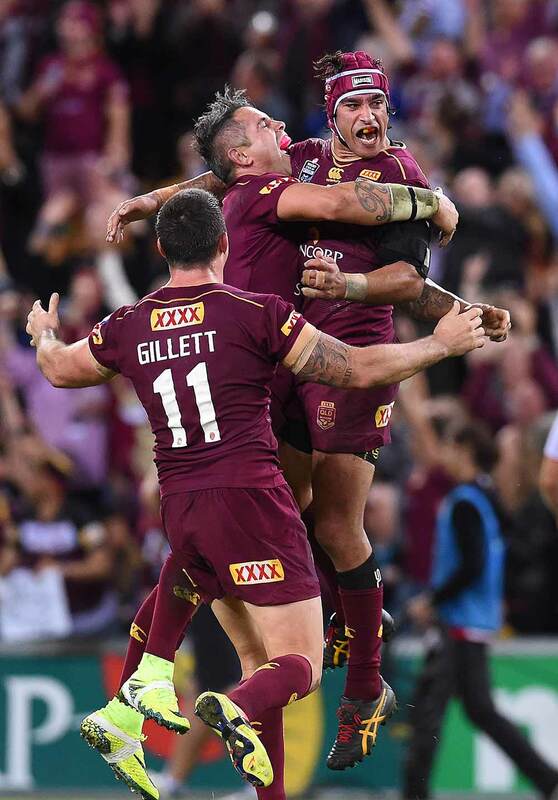 Holmes gives the Queenslanders an equal weapon in their arsenal. Debuts a year after he should have due to discipline issues, and joins that select bunch of players who played for their country before their state. Chambers’ 23 carries was a team-best in Game 1 and he deserves to be one of the first penned in, not least of all because of the lack of depth in his position. The more slippery surface in Sydney suits his gliding running style and will present defenders with problems. While Justin O’Neill wore most of the flak in the first-up encounter, Chambers will be mindful he also missed five tackles against the Blues and another five versus the Rabbitohs in round 11. His gutsy performance of a fortnight ago has won Gagai a new legion of fans. Ran for 220m from 21 carries and made an amazing 11 tackle busts when his team was under the pump. I’ve not been a fan of the popular call to switch him from wing to centre, purely because he did so well in his previous role. Sometimes changing the expectations of someone who has confidence in their existing role creates more problems than you anticipate. His biggest mistake in Game One was not being Billy Slater. A few banana adverts and a more impressive fringe would have got him out of trouble. Realistically, didn’t do a lot wrong behind a struggling pack in the opener, but bore the brunt of the spotlight nonetheless. Boyd’s made big strides in recent years to win people over in a number of areas and I’d be surprised if he didn’t produce something with the knockers in mind. Has come riding over the horizon like the fabled general leading the cavalry. But let’s be realistic about this – Thurston has been on the losing side in six of the last 14 Origins he has played. His mere inclusion doesn’t guarantee a thing unless the team starts travelling forwards and is prepared to put pedal to the floor when both teams are under the pump. There was a point in Game 1 when both teams were battling for breath and Queensland was first to break by kicking for the sideline. Given very little opportunity last time to show his wares and no doubt remains the best man for the role. That’s a pretty fair accolade of its own, given the quality of players queuing up behind him. 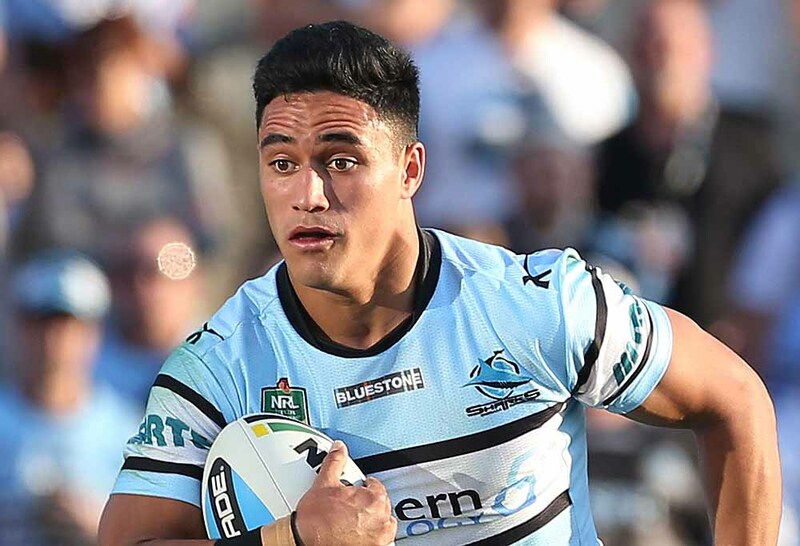 Was not credited with a single error against the Blues and had made just seven all season in the NRL going into last weekend. To give some perspective to that, there are players who have made more than three times as many errors, handling the ball far less frequently. Napa reminds me of the first time I took my wife on a date. She hopped in the car full of energy, but by the time we got to our destination, she was dead asleep. The Big Angry Ginge came out of the blocks pumped to his eyeballs in Game 1, then copped a knock and went into his shell, spending big minutes off the paddock. We’ll need to see more output over a sustained period for selectors to put the ring on the finger and pronounce Napa a year-to-year certainty. Must be feeling like Prince Philip with the number of people who’ve been lining up to say he’s past his expiry date. Certainly it wasn’t one of his standout efforts in Game One, but to denounce a seasoned champion is dangerous territory. He missed seven tackles in Game One, which was equal to his four previous club games combined. Maybe if he wasn’t left posted by some of his tight forwards, he would have had greater effectiveness in both attack and defence. I’m a subscriber to the train of thought that Papalii is either better used off the bench, or in a four-man prop rotation, rather than being asked to start in the back row in Origin. He created some big dents in attack when he had the opportunity, but only spent 57 minutes on the park and looked gassed. A massive problem across the park with Queensland in Game One was their forwards averaged almost 10 minutes per game less at club level than their Blues opponents. 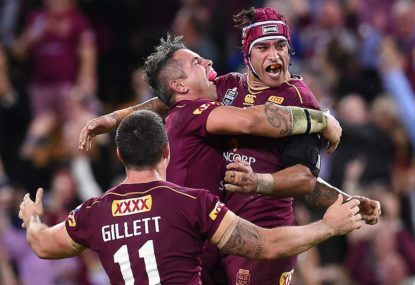 There would not have been a person in Queensland who begrudged Cooper the chance to finally make his Origin debut last year, after so long on the fringes. Played a decade of first grade before getting that opportunity, and will turn 32 this August. 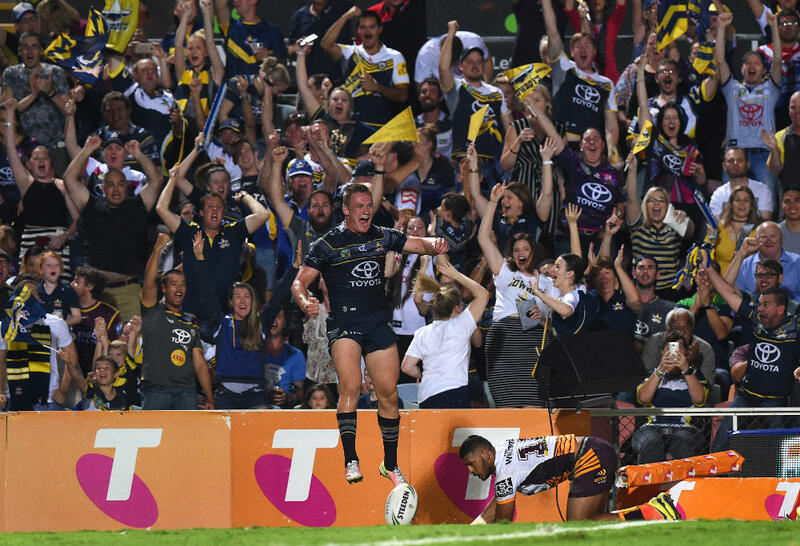 Those who’ve seen him play from a young age know he’s much more than Thurston’s right-hand man and can come up with big plays when the occasion is warranted. A deserved call-up. A typical whole-hearted effort from Gillett last time, but lacking in execution. He’s still the first running forward you’d pick for the Maroons, even after falling off seven tackles and failing to get to 10 carries from 80 minutes on the park in Game 1. I doubt a second game in a row like that would be tolerated however, and he’ll be expecting much greater output of himself this time around. It’s the one percenters where Gillett makes a difference, particularly on kick chases. Ploughed out more metres than any other Queensland forward in the first game of the series. People are expecting him to be Corey Parker, but we’ll have to accept they are two different players who bring slightly different strengths. McGuire didn’t have an effective offload last game, yet that’s no need to crucify him. Most people don’t realise Queensland had more offloads than New South Wales in the big loss – but a fat lot of good that did them! I really feel Morgan was poorly utilised in Game 1. The great thing having him in a squad provides is the ability to dice teams up around the ruck with a neat interplay of passes either before or after the markers. Queensland did this far too few times at Suncorp Stadium and somehow expected they’d outlast a fitter and bigger Blues pack through unimaginative one-outs off the dummy-half. If Queensland is to bounce back, they need to play smarter and involve Morgan in that process. What a weapon to bring on at the opportune time. Has awesome brute strength and the tearaway exuberance of a young colt. He hit a plateau for the Cowboys about a month ago, which will be of concern. Sometimes when a player looks bulletproof you forget they have a mental facet that needs to be finely-tuned as well. Hess has the hallmarks of a long-term Maroons player if they can find the trigger that gets him to explode. Let’s not forget the damage Carl Webb did at a young age. A whole-hearted performer who knows what it’s like to take the tough rucks when you’re up against it. He won’t put the absolute fear of God into NSW, but he won’t let them have it easy either. When others are falling off tackles or standing around with hands on hips, he’ll be popping up as he’s needed. Runs a great line in the attacking zone and that not only allows him to barge over for the occasional four-pointer, it also stretches defenders on teammates either side of him. The complication? An off-the-ball shoulder charge on Blake Ayshford could rule him out of the game. Wallace has pled not guilty and will front the judiciary on Tuesday night. After starting all but 24 of his 76 games for Melbourne on the interchange bench, Glasby’s selection comes as a bolt from the blue. A standout State League performer in his younger years for the Central Queensland Capras, he is high on reliability. Whether this makes his selection warranted over some of the tried-and-trusted performers in a similar mould is up for debate, though his inclusion does ensure the side goes into the rematch full of fresh enthusiasm and slightly younger legs.